One of the most common reasons people start looking into feeding raw dog food is that their dog is having health problems. They have tried numerous things to alleviate these health issues and nothing seems to work. The raw diet is often a last ditch effort, usually approached with trepidation and fear. Why do I feed raw dog food? 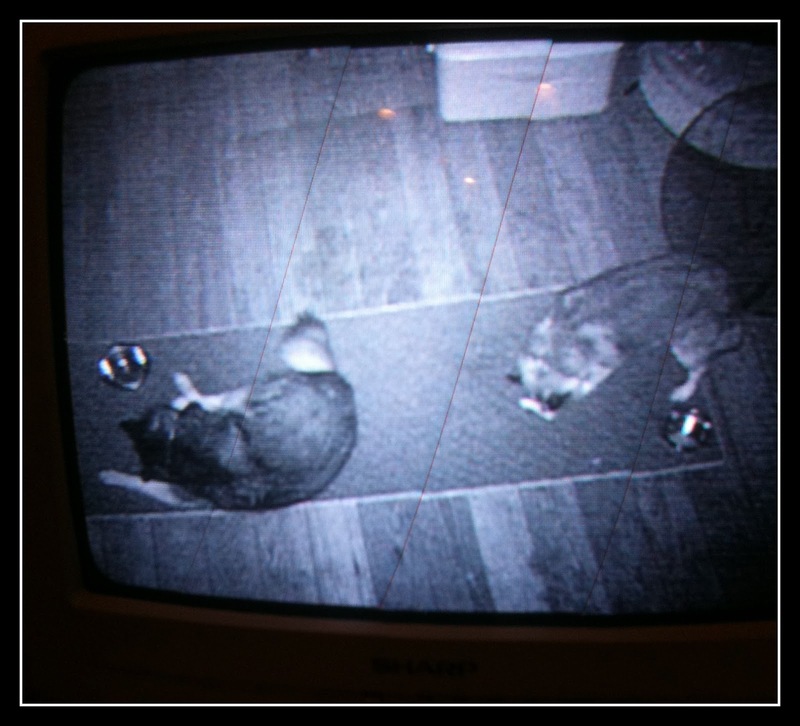 I have two Alaskan Klee Kai’s. The first, a girl named Xuxa, can eat anything - nothing ever gives her an upset stomach. At the time of this writing she is seven years old and has never had an episode of vomiting or diarrhea. I think she has a stomach lined with steel. My male dog Xander, however, is on the other end of the spectrum. We got him when he was 16 weeks old, and he has had a number of food-related issues since day one. Some days were better than others, and at first, he had mainly good days. As he got older, the bad days started to outnumber the good ones. At around 2 years of age, he started to have terrible days. He would poop a lot, up to ten times in succession, and to the point that he was pooping blood. During these episodes, he would often poop in the house despite the fact that he was very well house-trained. He literally could not hold it in, much to his dismay. We had taken him to the Vet on numerous occasions, slowly changing him from diet to diet in order to see which he could tolerate the best. Most of the time he would do well for a few weeks, but nothing ever completely worked - he was still having bad poop days every week or so. It was during this time that I started to research dog food and dog nutrition. I had heard about raw dog food before, but I thought it was a little too ‘out there’ for me. I had been a chef for 16 years and had owned and managed a number of restaurants. I had been completely focused on cooking, so raw was a little weird for me to grasp. Then Xander got pancreatitis. This was a horrific thing to watch - my dog was literally shaking in pain. 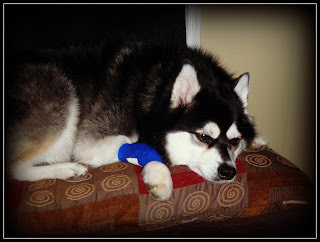 After five days of around the clock veterinary care, I.V. fluids, pain medication and very little food, he recovered. He was put on a diet, the prescription type you see at the vets office, and he was doing OK. Not thriving, but doing OK. He was alive, so I was happy. Three weeks later, though, the pancreatitis returned. The pain he was in was unbearable to watch. It required another five days of around the clock care, resulting in more sleepless nights for me and a large hole in my bank account. I had come to my breaking point. I decided to learn everything I could about dog nutrition, so I bought every book I could find and spoke to anyone who knew anything about dog food. As I covered more and more material, the information I learned about the dog food industry made me angrier and angrier, but it also made me more and more determined to do what was best for my dog. Look at my earlier post about what's really in your pets food. 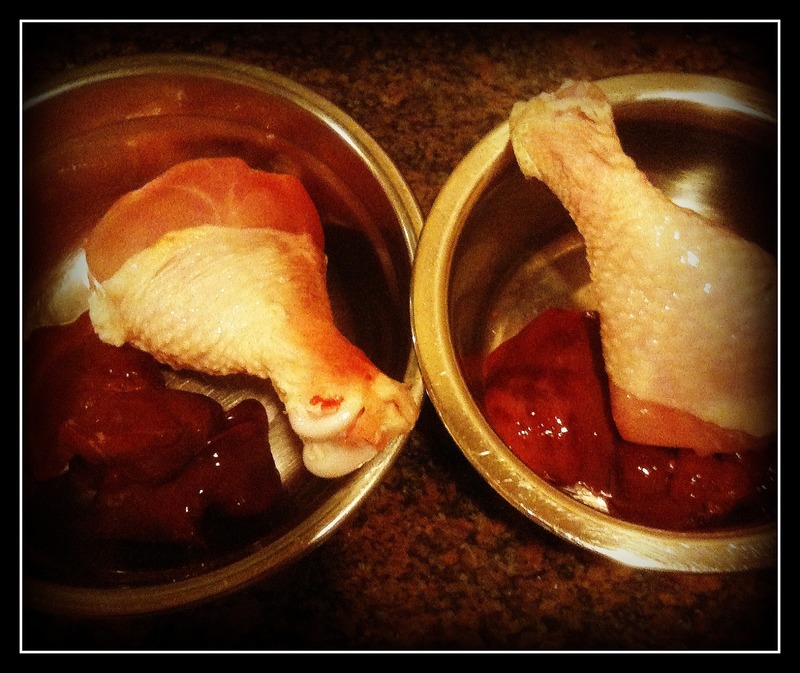 The decision to feed our dogs on raw dog food was not easy. It took almost two years of research. The fact that I live in a vegetarian household didn’t make the decision any easier. My partner was especially adamant about it, and he was not going to allow raw meat in his fridge. After a heated discussion, I was told, “if you want to feed our dogs raw meat, then you better get another fridge.” Twenty minutes later, I returned from the shopping mall with a new one. The next day, my dogs were being fed raw chicken - a raw chicken wing, to be exact. It took them a while to figure out what to do with it - initially, they just tried licking it. 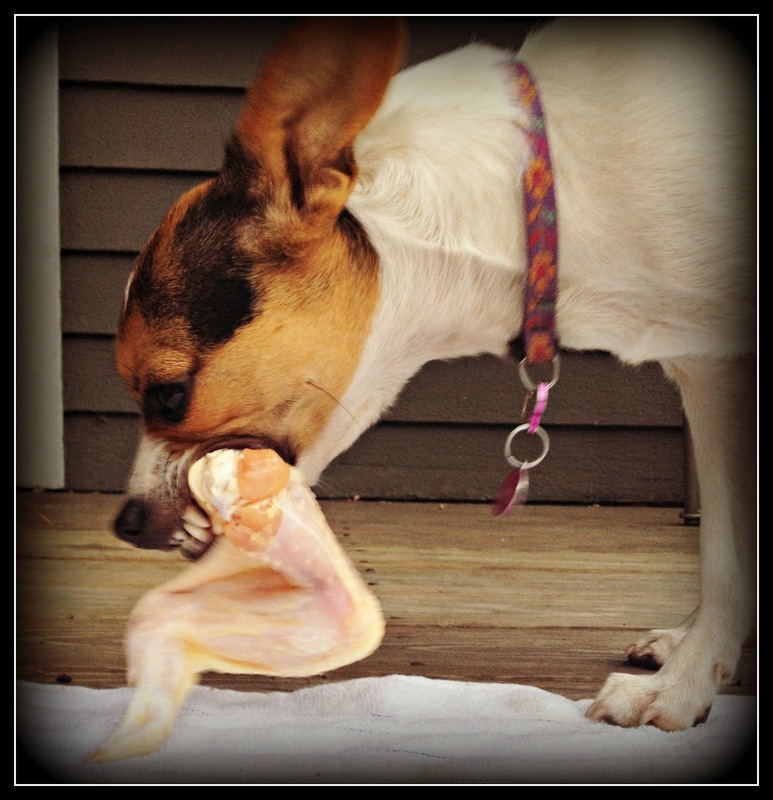 After about twenty minutes, Xuxa finally gave it a chew - I think I will always remember the sound of that first crunch of bone. As if on queue, Xander almost immediately did the same. They both proceeded to finish their wings in less than two minutes. When we first started feeding raw, we decided to feed them on the back deck to help limit the mess. Due to my nervousness about feeding them bones, I would stay out there with them until they had finished. Since it was the middle of winter with a foot of snow on the ground, this got old very quickly. My solution? 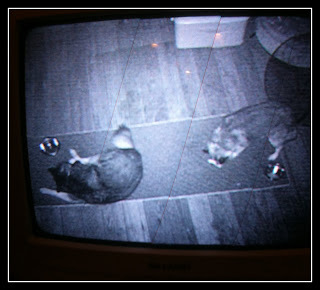 A security camera, so I could watch and hear their progress while remaining in the comfort of the house. After a while, raw feeding became old hat, and my fears and concerns were allayed. The camera broke and was never replaced. For the sake of convenience, the feeding moved into the kitchen. We now use easy to clean stainless steel bowls, and wash them with hot soapy water after every meal. A little bottle of cleaner and a paper towel clean up any food residue that accidentally drops to the floor. Currently, both of my dogs are very healthy. Xander has not had a bad day in years. We have blood tests done every six months to monitor his pancreatic enzymes, and his numbers have improved to the point that he now has normal blood levels. We have also added two more dogs to our household. This was not intentional - it turns out that we are foster failures. All are fed raw. Our youngest started her raw diet at only twelve weeks old, and she has never had a day’s sickness in her first year and a half of life. Comments or questions about raw dog food? On your recommendation I started feeding Emmett a raw diet last year. He never had any health issues, but i still think he is happier and healthier as a result of the switch. I also take a lot of pleasure in feeding him an obvious whole food diet. Passively feeding a scoop of kibble bummed me out. Now I just need to get myself on such a healthy diet! Emmett looks good. The super long walks I see you take him on, obviously help keep him trim. Raw dog food is truly very best for a pet. Your pet grows very healthy. Raw food is finest nutrition for any pet. I also give raw food to my pet dog (Lulu). He is rising very energetically. Raw dog food is truly very best for a pet.It is essential for all kind of dog.Raw dog food is truly very best for a pet. I prefer to feed my dog a raw diet as well. Like you, I was a little nervous at first. I totally remember that first sound of crunching bone as well! Now, I don't worry at all. My dog eats a lot of chicken and also some beef and pork, organ meat and some veggies. I do still feed dry food on occasion for convenience, but it tends to give him itchy skin. I'm so glad your dogs are doing well! A sound mental CBD for anxiety and depression system is very vital for success in life. If your mind is troubled or suffering from ill health, there's no way you can make any headway in life. However, you can always seek the help of a mental health therapist in order to deal with issues disturbing your mind anytime they occur.